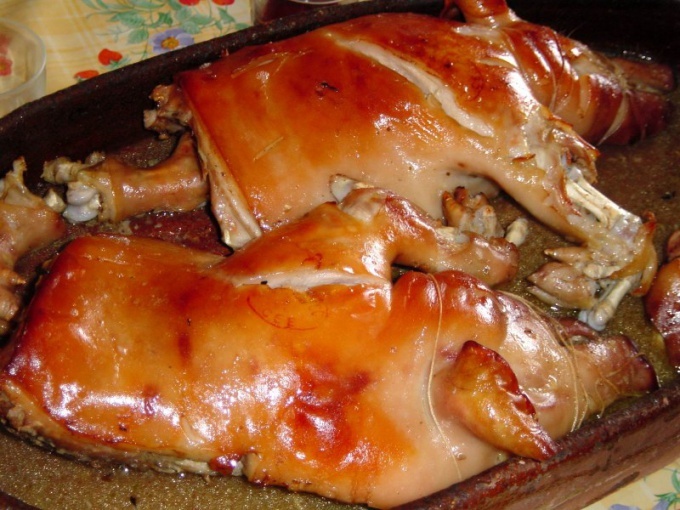 Pig, cooked whole, is a traditional festive dish. Bake it in the oven stuffed with offal, buckwheat and mushrooms. This dish will not leave indifferent even the most refined gourmet. Prepare the stuffing. Pork heart and liver , rinse under cold running water, place in a saucepan. Pour the giblets in cold water and leave them for 3-4 hours. Then remove from the pan and rinse again. Put liver and heart in a saucepan. Fill it with water so that it completely covered the guts. Cover pot and put on fire. Remove from pan cover, when its contents come to the boil. Collect with a spoon the foam from the broth. Reduce heat and continue to cook the giblets until tender. In the process of cooking they need salt. Put the finished guts on a plate, cool them and cut into small pieces. Loop 300 grams of mushrooms and wash them. Finely chop the mushrooms and fry them in vegetable oil. Peel 2 bulbs. Slice them and lightly fry with the addition of a small amount of vegetable oil. Cook buckwheat porridge. 1.7 litres of boiling water add 1 kg of buckwheat. Bring contents of saucepan to a boil, reduce heat, and cook the oatmeal until tender. Mix the buckwheat porridge, fried mushrooms, onion and chopped giblets. The stuffing is ready. Rinse the carcass gutted, scorched suckling pig. Dry on paper towel. RUB the bird inside with salt and fill with stuffing. Sew the abdominal incision coarse thread. Grease the pig completely with vegetable oil and place on a baking sheet up back. The legs fold. Wrap food foil the ears and snout of a pig, so they are not burned. Place baking sheet with stuffed pork in the oven, preheated to 180 degrees. Fry it until light brown. From time to time pour pig fat, bacon when roasting. Put the finished stuffed pig on a platter. Adorn it with fresh greens and vegetables. Bon appetit! Don't fill the pig with stuffing very much. While cooking may burst the seam. If the knife enters easily into the meat, while clear juice - the pig is ready.